The inValve product line replaces our popular VL2 plug-in and adds two models of the TL Audio hardware processors. To make the control consistent, they decided to use their own graphic interface. Behind the graphics, there are models of analog circuits, exact valve characteristics and advanced oversampling that increase the processing quality. Windows XP and Vista support dropped. Full support of Windows 10 and Mac OSX 10.10 and higher added. 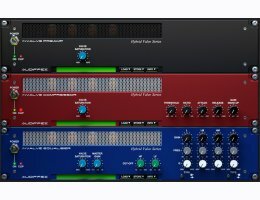 Improved compatibility with several host DAW Softwares. inValve | Preamp is a precise software emulation of a tube amplifier. The sound is not affected too much, it adds just warmth and smoothness you need for analog-like mixes. inValve | Equalizer is a four-band equalizer with a tube circuit emulation for each band. inValve | Compressor is a standard analog compressor emulation utilizing the characteristics of tubes. Demos can be downloaded from the Audified website!